Sorry about the beautifully-focused yarrow in the foreground and the sometimes-fuzzy wolf. I left some of these scenes in, because it’s not every day you see a wolf eating his kill. 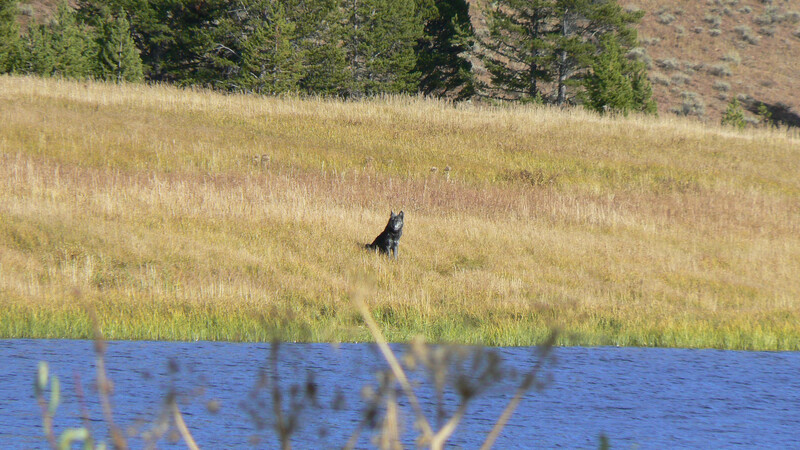 It wasn’t just by accident that we happened upon this wolf. The previous day we had met two backpackers on the trail who described their experience at Grebe Lake. Wolves had killed an elk a few feet from their tent, and they had to listen to the kill for most of the night. 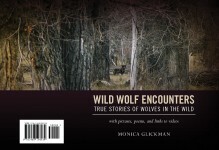 The next morning they saw the black wolf, who walked right by the tent. (They think he took their tent cover.) They made a beeline out – in the opposite direction from their car – and said they were very glad to see humans. The next day there was only one answer to the question of where to hike – to Grebe Lake! Fully expecting the trail to be closed (it wasn’t), we took it, looking around nervously for grizzlies who might be hurrying along in that direction. When we got to the lake, the ravens started screaming and calling and carried on for over an hour. When the wolf came out, they quieted down. I think they were warning him about us. Go ravens! You can hear them calling on the tape and see one in the grass waiting his turn. You can’t really see the wolf wiping his mouth, which he did frequently. But aside from wrestling with the carcass, which you wouldn’t expect to see at the dinner table, the wolf was quite mannerly. This entry was posted in Birds, national parks, Nature, Poems, politics, wilderness, wolves, Yellowstone and tagged animal rights, animals, birds, Endangered Species Act, national parks, nature, NRDC, poems, poetry, politics, ravens, wilderness, wolves, Yellowstone. Bookmark the permalink. Josh, that’s so cool! Thanks for letting me know – I will check it out. Saw your video on Yellowstone’s Facebook page! Hi Laz, Yes, I’m consumed by this, probably will be for a while. Definitely a wicked concept, one worth looking into. Thanks so much for visiting, Androgoth – a wonderful weekend to you, too. 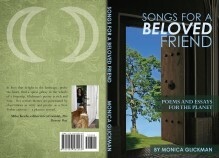 Amazing Monica, Natures beauty(necessity) right there…..
Isn’t he, though, Bluebee??!! A dream of a wolf! Those are probably raven cries, mostly, although there were also some eagles flying overhead, making some very strange calls. I have the eagles on video, too. But the ravens were very excited, flew right over our heads as we left. There is some strong connection between ravens and wolves that people are just beginning to learn about. Yes, Sandy, we lug around some small cameras and binoculars. I wish I could photograph through the binoculars – that would be a shot. Lots of people along the road have heavy-duty equipment, but it’s too big to carry into the backcountry. Pen, I’m glad you didn’t mind the blurry spots. It was such an honor to be there, to realize that I had some mythical ideas of my own about how a wolf would eat. He was very nervous though, always coming and going, looking around. Couldn’t really relax and enjoy. I guess an animal in the wild rarely gets to relax. Have you just been out filming? How neat that you can do this. I am looking forward to seeing more of your work.